BC’s Wills, Estate and Succession Act (WESA), section 37, sets out the requirements to make a valid will in BC. 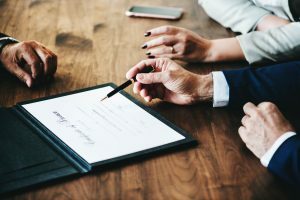 However, sometimes a loved one may have written down their intentions for their estate without making a formal will that does not meet the requirements under WESA. Under the section 58 of WESA, the BC Supreme Court has the power to find that a record, document or writing or marking on a will or document represents the will of the deceased. The section is not limited to paper documents as “record” includes electronically stored data like an email or a word document. The BC Supreme recently applied this section of WESA to an estate dispute in Cooke Estate (RE), 2019 BCSC 417 over a handwritten note the deceased made shortly before passing. In Re Cooke, an executrix sought to have a court declare a handwritten document composed by the deceased several days before she became unresponsive and in which she altered her will by excluding her one of her other daughters as a beneficiary. When applying section 58, the court looks at whether the document or record is authentic and whether it represents the “fixed and final intention” of the deceased person based on the available evidence. Mr. Justice Abrioux for the court reiterated the purpose of the broad powers under WESA is to avoid having an otherwise valid will thwarted for strictly technical formalities. Section 58 of the WESA is a broad curative provision. It provides the court with the discretion to validate a document which has not been made in compliance with the formalities of will-making found in s. 37 of the WESA, and allow it to be admitted to probate, if satisfied that the document “represents the testamentary intentions of the will-maker”. The purpose of this remedial provision is to avoid the defeat of a will-maker’s genuine intentions due to some technical defect. The applicable test under s. 58 of the WESA has two main parts: (1) whether the record, document, or writing is “authentic” and (2) whether the record, document or writing represents the deliberate or fixed and final intention of the deceased person: Hadley Estate, at para. 36. While the court found the handwritten document to be authentic, they could not decide whether the document was truly the fixed and final wishes of the deceased without hearing from the key witnesses. Additionally, the court noted the special rules that apply to challenging a will. If probate has been applied for or granted, the Rule 25-14 of the Supreme Court Civil Rules a person must file a notice of application or petition. If the court finds there is a triable issue that cannot be resolved by way of a petition or application, they may order a trial. If you need legal help with varying or challenging a will, dealing with executors or defending a wills variation claim, give our firm a call: 604.264.5550 or contact us.